Juice up your mobile using this low cost charger with a 2200mAh battery. The not so well known company Portronics (Not Protronics, this is an electronic device that attaches to the Port...geddit!? 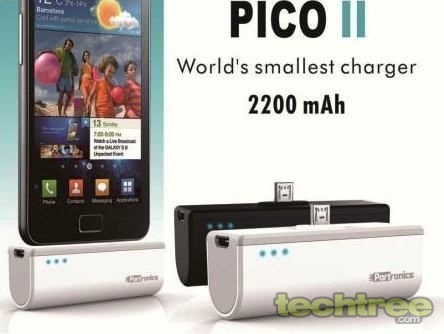 ), has launched their tiniest mobile charger called Pico II. It is powered by a 2200 mAh battery, comes in colours of black and white and costs Rs 1,299. Pico II solves two problems of the world of smartphones today, sucky battery life and portability. While it doesn't do this in a revolutionary way, it does do the job without much fuss. The emergency battery-powered charger attaches to the micro-USB port of your smartphone and slowly but steadily juices it up. While this will add to the bulk and size of your smartphone, atleast you will not be stuck desperately trying to finish your long Temple Run level. Luckily Pico II will work with all smartphones with a micro-USB slot and also your Apple 4S or 5 Connectors. Oh, and Pico II smartly comes with an LED battery charge meter to tell you how much charge is level on this little juicer. Includes 2200 mAh power pack, micro USB cable, user manual. Adds up to 10 hours of battery life for 3G users and up to 19hours for 2G. 4 point LED's power indicator display the remaining charge in 25% increments. Built-in micro USB tip for use with all micro USB compatible phones.